Eleanor Alice Burford Hibbert, also known as Jean Plaidy, Victoria Holt, Philippa Carr, Ellalice Tate, Eleanor Burford, Anna Percival, Elbur Ford and Kathleen Kellow, was born in London in 1906. 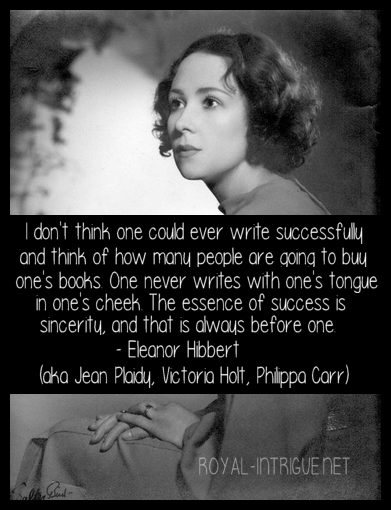 She was a remarkably prolific author who began her career like many of her era, with serials in magazines. She has written more than 200 historical novels, Gothic romantic suspense novels, and historical “romances”, as well as modern day novels (under the Burford pseudonym) and true crime stories (Elbur Ford). Mrs. Hibbert passed away at the age of 86 on a cruise ship on January 18, 1993. I started my Jean Plaidy fan site, Royal-Intrigue.net, in 2006. It has–like my collection–grown considerably, with a Facebook Page, Twitter and many articles and reviews. I own over 300 books by the author, many the same title in a different format/cover. I have several rare volumes, as well as signed items, photos and magazine articles.